Vladimir Stepanovich Polin (1908-1975) scientist – physicist with scientific degree “Candidate of Physical and Mathematical Sciences”. He taught at the Moscow Pedagogical Institute (now university) until 1941. After the war he returned to scientific work and actively initiated research and development of digital electronic computers. He was appointed as chief of Design Bureau for Industrial Automation, subjected to the Ministry of Radio-engineering Industry, which was mainly producing specialised (ordered by various defence organisations) computing machinery. In 1950-1960 his team produced computers based on electron tubes and later on semiconductors. During the work V.S. Polin and his collaborators were closely cooperating with famous computer research centres of S.A. Lebedev and B.I. Rameev. In 1959–1964 the Design Bureau produced universal semiconductor computer of high performance - “Vesna” (‘the Spring') and in 1961–1965 its extended variant “Sigma” and abridged one “Sneg” (snow). In industrial production catalogues they stood as SPEM-50 and SPEM-20 respectively. Those were serially produced by the Minsk computer plant (‘G.K. Ordzhonikidze plant'), basically civil enterprise, however with special military customers service. The computers were widely used by various defense organizations. They were implemented for solving broad spectrum of problems, among them maintenance of large information-research defense systems and also systems of automatic control. In 1 965–1975 V.S. Polin with his team developed and implemented data transmission systems (networks) which used computers as information switching nodes. It was one of the USSR first experiences in that field. Main components and units of “Vesna” formed basis for producing of more advanced specialised computing systems in the following years. In 1967 the bureau proposed a perspective project of the third generation computers compatible on the software (programming) level. The computer family was called “Ryad” (row) and V.K. Levin was appointed as its designer in chief. Results of their research were implemented during creation of the Unified System of Computers (ES). That work was performed already at another institute (Scientific Research Centre for Electronic Computing Engineering) newly established in 1968. Considerable part of the Bureau scientific personnel was transferred there. Research and design within projects ‘Vesna' and ‘Ryad' were performed in co-operation with the Institute of Applied Mathematics (AS USSR) which controlled development of their structures and operating system software. Some more institutes joined the work, Institute of Computing Machinery produced input-output devices, some units were designed by the Institute of Computer Engineering, etc. In 1968–1975 the Bureau launched research on information protection in computation systems. The first executive instructions and other directive documents were issued under guidance of Y.A. 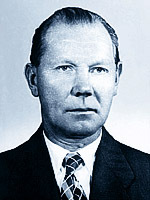 Kotov – the Bureau chief engineer at that time. Polin's bureau was also famous for researches on optical reading devices - printed text signs recognition. In 1957 V.S. Polin was awarded “Lenin Premium” for his successful design of specialised computers. 2. ‘Universal' – of universal application possibilities, oppositely to special computers. 3.Georgy Ordzhonikidze was the USSR popular minister of heavy industry in the period of beginning intensive industrial development Minsk computer plant was one of important enterprises for serial industrial production of computing machinery. 5.Unified System of Computers – large-scale international project of joint computer research, development and production, successfully performed by the socialist countries of the East Europe and Cuba in 1970-1990. 6. The USSR highest official premium.